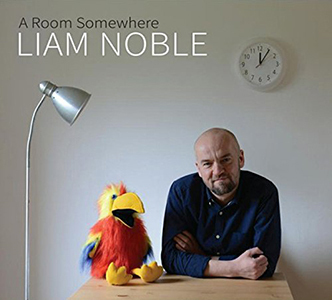 LISTENING BACK through the CD collection of recent years, it’s the inquiring pianism of Liam Noble that provides an edge to recordings by the likes of Mark Lockheart, Julian Siegel, Alex Garnett and the delightfully anarchic Pigfoot. Now, with his first solo release in 20 years, the pianist quite remarkably reveals his intentional avoidance of writing music for the two-day studio session. And whilst such ultimate freedom in improvisation might initially seem disconcerting, the recorded opportunity to re-visit these imaginings provides the intrigue (Noble likening his deconstructed interpretations of familiar tunes to slalom skiing: “Taking out all the poles, only a bare slope remains. So I leave some in, but try to surprise myself (and the listener) about where they are”). It’s a fascinating course to traverse, the recognisable melody of Wouldn’t It Be Loverly (the ‘room somewhere’ from My Fair Lady) coming more clearly into view towards the finishing line, once Noble has freestyled obliquely. Through its sparseness and melancholy, Paul Simon’s Tenderness is easily discerned, though flecked with sumptuous, alternative chordal colour and sensitive rubato; and Noble’s bubbling solo piano variation of Directions is striking in its acoustic interpretation of Joe Zawinul’s electronic, early fusion abstractness. Classic There Is No Greater Love swaggers and swings brightly (imagine an animated and varied conversation between Ellington and Monk) – and here, as frequently throughout the album’s sequence, the urge to replay and catch new detail is compelling. Indeed, Thelonious Monk’s own Round Midnight hides amongst the shadows in Noble’s considered ruminations, demanding careful attention. The memory of the late, great Kenny Wheeler is honoured in a bustling reading of Sophie (from Music for Large & Small Ensembles); and standard Body and Soul is the subject of perhaps the most impressionistic of all of the pianist’s concepts, initially far removed from any thoughts of Louis or Billie – yet it slowly and delicately unfurls to reveal its beauteous jazz hues. Six White Horses is a real ear-grabber, with Noble simulating so well the US Country feel of the galloping, banjo-accompanied original, especially through judicious internal muting of the piano strings. And then there are Noble’s own creations – Major Minor, which rings to deep-end prepared piano and percussive, Ginastera-like flair; Now, whose chiming harmonics are a joy (with Debussian overdub melodic variation Now and Then); and I Wish Played Guitar, its magnificently disturbed undertow reflecting the title. Quite what Sir Ed (and Lady Elgar) might think of the pianist’s closing “tinkering” with their engagement celebration piece, Salut d’Amour… well, I could probably guess! But, though it takes far more liberties than Ken Russell’s classic Monitor movie of the early ’60s, it does reveal a deep understanding of the salon favourite’s harmonic structure – and ‘Edu’ enjoyed a jape or two. Released on 25 May 2015 – on Basho Records – A Room Somewhere is available from JazzCDs and all good jazz outlets.